Writing about a John Green is very much like writing about Cloud Cult album. Each person's experience with the story or the music is deeply personal and very much their own, hard to explain to other people. If you're reading this, it's important to keep in mind that I don't write reviews (I refuse to comment on the whether this story is objectively good or not), I write my thoughts on what a book means to me. I teared up only at two parts in this book, and it was only for a few seconds at a time. (Paper Towns and Looking for Alaska had me properly crying.) The first part was when Gus was trying to buy a pack of cigarettes and the second part was when Hazel was describing number ten pain (keeping this part succinct to avoid spoilers). 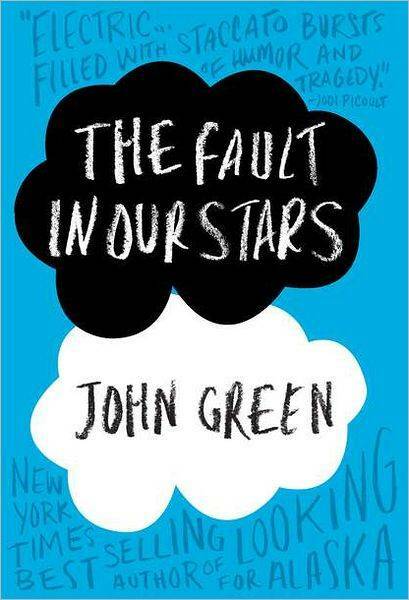 The only reason this book made me feel emotional was when I thought 'What if [name of the guy I like] was in Gus's place?' That really messed with me, I felt so awful. I couldn't even begin to imagine and yet I felt this bad, what if it was actually true? I felt terrified in that instant of losing him, something I never actually felt before. So this was a bit of a shock for me. It was an intense feeling, but totally unlike the feelings I've gotten from John's other writings. It was all hypothetical, whereas John's other writings described exactly how I felt at the time and what I was going through, so they were a whole lot more emotional for me. Out of all of John's novels, I think this one is clearly the best for parents to read. Parents have always played some role in John's stories, but in this novel that role is the most significant. If I knew someone who had a teenager with cancer, I would give them this book. It's so heartbreaking how desperate Hazel is to find out what happens to Anne's mother in An Imperial Afflication. I know John has the experience to be able to paint a very realistic relationship between between a terminally ill child and her parents, and I feel the story does just that. A ranking of my favourite John Green novels, in order of most favourite to less favourite: Paper Towns, Looking for Alaska, The Fault in Our Stars, An Abundance of Katherines, Will Grayson. For me, TFiOS sits solidly in the middle. For me, it was a good book, a solid book, but LfA and PT were far more relatable to me. Those stories meant something to me on a deeper personal level. TFiOS, I feel, appeals to a larger audience. I'm not really affected by dying, by the realization that my life is coming to an end, not yet. I don't know anyone who is terminally ill. I am not saying I did not like this book because I couldn't understand or relate to the story (believe me, I could, see paragraph about why I cried), just that I like the other two novels more because they meant more to me personally and were more real for me. Last thing to write about: How I acquired TFiOS and what I found written upon it. I preordered a copy for myself and a copy for my sister in November. Even so, I went around town searching for Hanklerfishes and yetis on the day of release. It was very exciting, finally holding the physical book in my hands (it's a real object!) and seeing all the pages that John had signed. I found green, purple and black jscribbles but nothing out of the ordinary. I actually thought about buying a copy just because I didn't want to wait, but I didn't. I ended up buying a copy in-store today :P (purple jscribble). After I finished reading it, I checked the status of my shipment from Chapters and saw that it was delivered this morning XD So, of coure, I ran down to the mailbox and ran all the way back. I had my mom watch as I opened the box, pulled the two copies out and picked one for myself. (This is because one copy was for my sister and what if one was Hanklerfished or Yetied and the other wasn't, how would we decided? We would pick our copy without looking first). I eagerly opened up to the first page...and found a black jscribble and a green Hanklerfish!!! I was extremely pleased, this was very exciting for me :) Anyhow, on a more serious note: I think it's crazy that something like this can really exist, that I hear about this book for months and months on end, I see the cover, I watch live shows of John signing the book, I see Hank scribbling Hanklerfishes, etc., all through my computer screen and then suddenly one day it's so real and I'm reading the story, and this is what it all comes down to, these printed words on these solid pages. The book exists, the pages exists, the scribbles inside it exist. It's all somewhat magical for me (I wrote a more articulate Tumblr post about this feeling when I received my Explorers 6 vinyl). After I finished reading the book and had discovered my jscribble and hanklerfish, I was full of conflicting emotions in a way I've never felt so conflicted before (I am very clear in my emotions, I always know exactly how I feel). I was happy to have my copy, to see the jscribble and the hanklerfish, but I was also still feeling so gutted and empty and sad from the story. My stomach felt strange and I couldn't really eat supper. Now the extremes of the emotions have worn off, but I still feel happy-sad. It's a weird feeling and I know it comes from a very tame situation ('A book made you feel so happy and so sad at the same time? All because of a signature?') but it's a first for me. I couldn't put this book down. It made me laugh and cry, sometimes at the same time. This book reaches in and grabs you by your soul. Beautifully written and haunting.